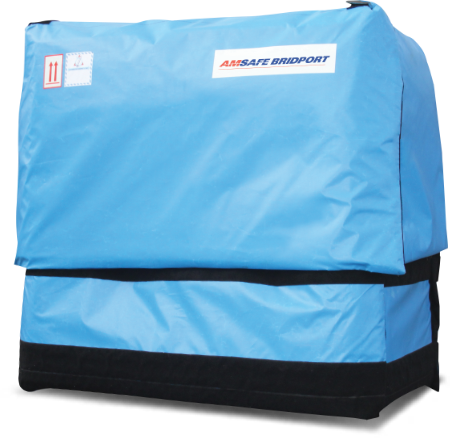 The DuPont™ Tyvek® range of thermal air cargo covers, which AmSafe Bridport provide, will give peace of mind that your temperature sensitive products will reach their destination safely, integrity assured. Reduces product deterioration, lowering exposure to sudden ambient temperature changes due to long transit times & extended time on the tarmac. Maintain product quality within specified temperature zones during the global distribution process. Facilitates consistent storage, handling and transportation. Are you shipping a Controlled Room Temperature (CRT) category product? Take a look at our question and answer guide below. 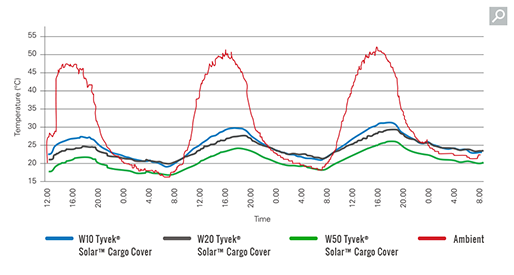 The effect of exposure to solar radiation and extremes of ambient temperature on goods protected by the DuPont™ Tyvek® Cargo Cover. Spotlighting the latest innovations in the supply chain, temperature controlled technology and strategies. 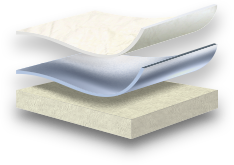 DuPont is launching a new ULD cover that will offer protection from a wider range of temperatures. "It was great to see our thermal air cargo covers in action during our trip to Basel Airport, it was Tyvek heaven!" Are you shipping a Controlled Room Temperature (CRT) category product? The nominal CRT temperature band of 15 to 25°C covers a large proportion of the finished pharmaceuticals that are transported across the world. Over 80% of all finished pharma products are now subject to the revised EU GDP which took effect in September 2013 and which extended regulatory controls to this category. Tyvek® Air Cargo Covers provide a reliable, affordable and professional solution for pharmaceutical manufacturers and logistics providers to meet the new GDP requirement for CRT products. The unique triple-action temperature management of Tyvek® Cargo Covers provides proven protection against extreme temperatures in cases of short-duration breaks in the cold chain. For example, they will typically provide several hours of extended cold-break protection to CRT products. Are you using a premium pharma coolchain service or are you shipping with a standard (economy, deferred) cargo service? An expensive specialised pharma service may come with guarantees with respect to temperature integrity but standard services offer no such assurances. It is important that precautions are taken to provide product protection in the event of unanticipated thermal events. Tests in the field have shown that Tyvek® Air Cargo Covers offer significantly better solar protection under real-life conditions than practically all other membrane- based materials and systems that are in widespread use for passive CRT protection. What precautions are in place to protect your pharma product from solar radiation? Solar radiation exposure is the single weakest link in the entire pharma cool chain. According to IATA, 57% of temperature excursions occur during these 'uncontrolled' air-cargo stages of the distribution process. Research by DuPont and others has clearly demonstrated that the real enemy when it comes to unwanted temperature excursions in air cargo scenarios is not ambient temperature differences but the 'greenhouse effects’ of exposures, even brief ones, to solar radiation. This means that it is primarily a material's thermal reflectivity rather than its insulative characteristics that must be considered when specifying CRT pallet covers. DuPont™ research has confirmed recent findings from independent studies which show that some commonly used cover materials actually exacerbate the greenhouse effects of solar exposure. So although these covers may give some protection against ambient temperature deviations they fall down in real life situations due to their ineffectiveness against solar gain incidents - the prime cause of significant temperature excursions. Is your pharma merchandise being transported between different climatic zones? 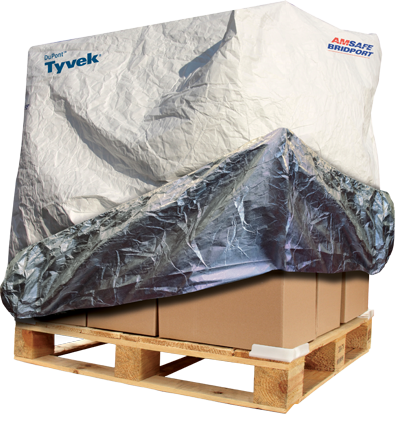 Tyvek® Air Cargo Covers provide product protection at both ends of the temperature spectrum. Pallets stay cooler in hot conditions and are protected from damaging sub-zero temperatures in cold climates. They also help prevent cold-sensitive merchandise from freezing in sub-zero temperature conditions, a scenario that can seriously compromise product safety and quality. Don’t forget that bulky, metallised bubble-wrap-based covers have been shown to have the potential for greatly amplifying the heat gain from radiation sources. Do your pharma consignments travel belly freight, dedicated freighter or both? Belly freight carriage can be a flexible, convenient and cost effective means of transportation for pharmaceuticals. But it can introduce challenges when it comes to product handling and preserving temperature integrity. Different operational constraints and different commercial priorities for belly freight service operators can put strains on the pharma cool chain. The use of a Tyvek® Air Cargo Cover can provide the necessary thermal security to make belly freight a feasible option. Is your pharma product flying to, or from, a less-developed part of the world? Infrastructure limitations, inefficient ramp handling and a lack of staff awareness in some countries and regions creates a huge risk factor for heat-sensitive pharma products. These risks, coupled to the universal risks of flight plan changes - delays, stopovers, cancellation, technical problems, modal transfers, customs / regulatory interventions etc. make the need for adequate product protection more necessary than ever. As part of a qualified shipping lane solution, Tyvek® Air Cargo Covers can provide the protection necessary for many CRT pharmaceutical products. Are you shipping a generic pharma product? The price-sensitivity of generic drugs means that any air-logistics solution must be dependable, effective and affordable. Rather than move the mode of shipment to sea and face a whole new raft of risk and uncertainty, not to mention tying up millions of dollars worth of stock for several weeks, the use of a cost-effective, thermally-efficient Tyvek® Air Cargo Cover solution should be considered. Is your product a 2-8°C biologic that would benefit from secondary protection? Complex biologics almost invariably require the speed and on-time certainty of air freight and it is vital that heat sensitive biologics are kept within their, often narrow, temperature limits. Tyvek® Air Cargo Covers can be used to introduce a measure of redundancy to the chosen packaging/ storage/ transportation in order to mitigate against the possibility of wildly fluctuating temperatures and unforeseen thermal events. Is your product shipped in active ULD containers or in heat-insulated passive container/packaging? ULDs can be exposed to extreme temperature conditions during apron transfers and standing times. Solar radiation in particular can cause the temperature of the metal alloy walls of containers to rocket to dangerous levels and compromise the effectiveness of the unit. 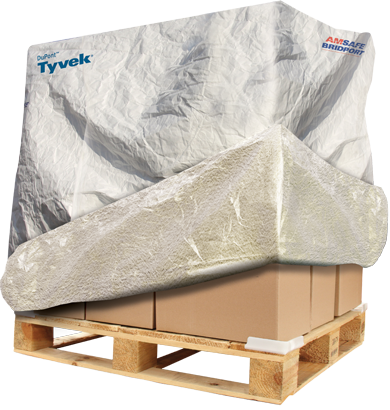 Tests with Tyvek® Air Cargo Covers have shown they keep peak internal air temperatures of ULDs 20-30°C degrees cooler than those in identical ULDs without Tyvek® covers. They can also be used to provide additional thermal reinforcement for sensitive merchandise shipped in passive heat insulated containers. Are you paying to ship air? With more and more airlines using 'dimensional' or 'volume' weight rather than 'actual weight' to calculate fuel and other surcharges, it is important for pharma shippers to trim both the weight and bulk of their freight packaging. Traditional thermal cargo covers can significantly contribute to airfreight cost due to their bulk and weight. A thickly insulated cargo cover, or even a bulky 'bubblewrap' type material, can easily be adding tens of euros/dollars to the intercontinental air freight cost of a typical, volumetrically-charged, Euro pallet. 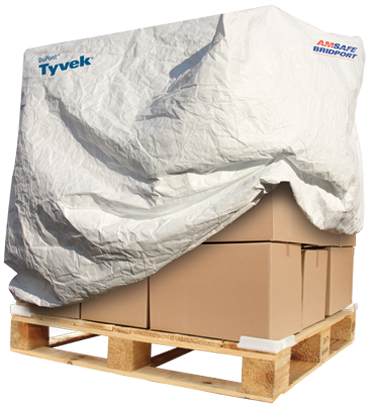 By switching from thick, heavy, cumbersome thermal blankets to DuPont™ Tyvek® Air Cargo Covers you could achieve considerable savings on total air freight charges. And, as a single-use cover, there are no backhaul complications with Tyvek® Air Cargo covers. Is your current cargo cover environmentally-friendly? Tyvek® Air Cargo covers are made from 100% HDPE (recycle class 2) which is a fully recoverable material. The low weight and low volume of Tyvek® Air Cargo covers also reduces your impact on the environment. Is your precious pharma cargo protected from labelling damage? Damage to the labelling of pharma merchandise can be just as serious as damage to the product itself. Excess moisture, heat and UV radiation can lead to the deterioration of product labels. This affects the safety and compliance of the shipment. The specific breathability attribute of Tyvek® material allows any trapped moisture to escape which will protect label integrity and prevent packaging damage. Is your cargo cover easy to use? In practice, the quicker and easier it is to protect your product the more likely it is to remain in a temperature-compliant condition. Even in the largest sizes Tyvek® Air Cargo Covers are very quick to install and remove, with a typical pallet or ULD being capable of being protected in as little as one to two minutes. Can your cargo covers be customised to your specific requirements? Tyvek® Air Cargo Covers can be produced in custom sizes to suit your specific pack/shipment sizes and they can be manufactured ready-printed with your corporate logo or product branding*.